Today's high temperature at Washington of at least 100° as of the 5 pm report marks the 7th time this month that the temperature has reached triple digits. That breaks the record of 6 in July 1930. 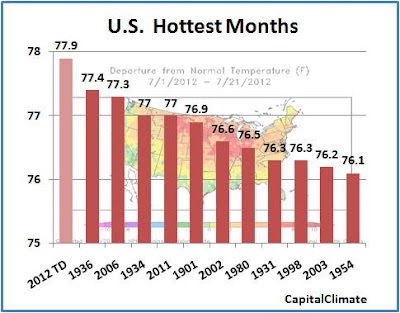 This also keeps the month firmly on track for the second hottest month in Washington history. The weekly U.S. Drought Monitor report posted this morning shows that the total Abnormally Dry/Drought area declined slightly to 80.1%, but the drought intensity increased. The total Severe to Exceptional (D2-D4) area increased to 45.6%. 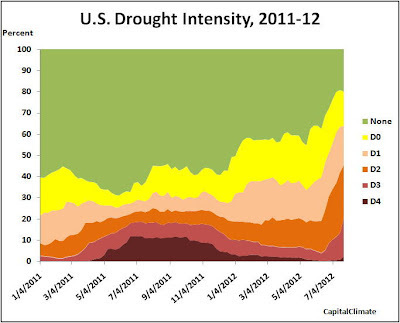 The area of Extreme drought (D3) jumped by over 5 percentage points to 18.2%, and Exceptional (D4) more than doubled to 2.4%. A strong upper-level ridge of high pressure continued to dominate the nation’s weather this U.S. Drought Monitor (USDM) week, bringing well above-normal temperatures to much of the country east of the Rockies. Beneath the core of the high, hot and dry weather baked the central and southern Plains to Ohio Valley. Monsoon showers and thunderstorms brought areas of rain to the West, cool fronts moving along the high’s northern edge triggered scattered showers and thunderstorms in the northern tier states, and a front skirting the high dropped beneficial rain along its eastern and southern peripheries. July 22 U.S. Department of Agriculture (USDA) reports indicated that 55 percent of the nation’s pasture and rangeland was in poor to very poor condition, breaking last week’s record. In the Plains and Midwest states, crop losses mounted, ranchers liquidated herds, and trees continued to drop leaves and branches. On July 25, USDA Secretary Tom Vilsack designated 76 additional counties in six states as drought disaster areas, bringing the total for the 2012 crop year to 1369 counties across 31 states. Over two dozen large wildfires were burning by the end of the USDM week – most in the West but several in the Plains. Congress Addresses Drought Crisis Through Action on Farm Bill; Wait, What? 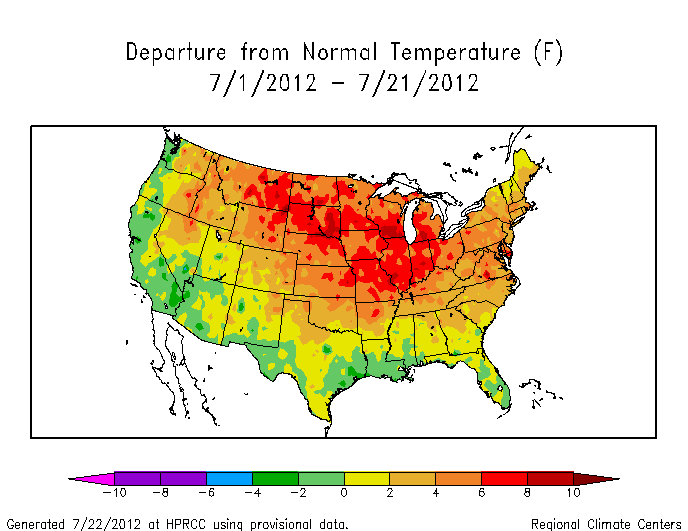 July 31, PM Update: Once again, the temperature has outperformed expectations, with another high of 90°. 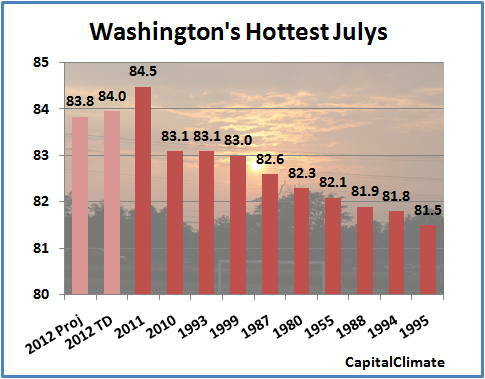 This gives a final monthly average of 84.0°, the second hottest month in Washington climate history. July 30, PM Update: The preliminary high/low temperatures are enough to keep the projection at 83.9°, even if the high tomorrow is only 84°. A high of 85° or higher would push it up to 84.0° as long as the low is at least 74°. July 29, PM Update: The daily high underperformed the original forecast by 1°, but the current outlook for the next 2 days keeps the projected monthly average at 83.9°. July 28, PM Update: Today's preliminary average temperature exceeds the forecast by 3.5° and raises the projected monthly average to 83.9°. July 27, PM Update: Today's high of 95° underperformed the forecast by 2°, but the projection remains the same. July 26 Update: Today's high/low temperatures of 100°/74° raise the month-to-date average to 84.1°, while the projected average is back to 83.8°. In order for the final average to avoid being the second hottest month on record, the next 5 days would have to be at least 4.5° below the forecast (see table above). 5:30 PM Update: Since the chart was made, today's preliminary daily high has reached 89°, pushing the projected monthly average temperature up another tenth of a degree to 83.9°. As noted last week, the first half of July put Washington firmly on track for a top-3 hottest July (and therefore top-3 hottest all-time month) for the third consecutive year. Despite a daily record low maximum temperature, the monthly average to date of 84° is still within half a degree of last year's record and well above the second place 2010 (tied with 1993). With forecast temperatures near a possible monthly record 7th 100° reading tomorrow and upper 90s on Friday, even a return to more seasonable levels by the 31st puts the projected monthly average at 83.8°, halfway between July 2010 and 2011. At this point, temperatures for all of the next 6 days would have to average at least 4° below the forecast in order for this July to drop below second place on the all-time hottest list. July 24 Update: The National Climatic Data Center preliminary monthly average temperature through July 21, posted today, is 77.6°, which is still 0.2° above the previous record. 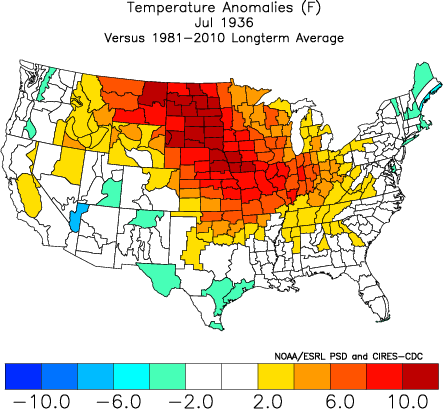 With 10 days left in July, the 32nd consecutive week of warmer than average temperatures has put the U.S. on track for the hottest month since national temperature records began in 1895. 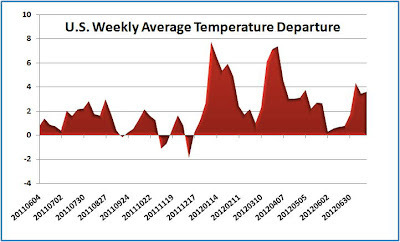 CapitalClimate analysis of National Weather Service reports from 215 stations across the 48 contiguous states shows that the unadjusted U.S. national average temperature was 3.6° above climatological normal for the week ending yesterday, July 21, up from 2.9° last week. With the National Climatic Data Center adjusted month-to-date average of 77.9° through July 14, it is now likely that the July average through the first 3 weeks of the month will exceed the all-time hottest U.S. month of July 1936 at 77.4°. This is not a prediction, but if present trends continue, July 2012 would become the new record hottest month. If this does occur, 2 out of the 5 hottest months will have occurred within the last 2 years, and 3 out of the 5 will have occurred within the last 7 years (July 2006 being the third). Note that all of the hottest months shown in the chart at the top are July; the hottest August on record was 75.8° in 1983. The charts to the right show the current month-to-date average temperatures through July 21 and the July 1936 monthly average. The numerical scales are equivalent, but the color schemes are not identical. In particular, the white area for 1936 corresponds to both yellow and light green for 2012.